We believe a company’s prosperity depends on the perfect combination of employees and clients: Talent and sales pipelines are valued equally. Given the tight labor market, workplace strategy has escalated to a critical component with many of our clients in meeting their company’s growth trajectory goals. Volunteering to serve in programs with needs that align with our business strengths is a winning strategy for meeting colleagues, leaders, prospective customers and in this case, students who might become interns or employees. The tri-campus UW Husky Leadership program matches participating businesses with students seeking to learn leadership skills. It’s a growth opportunity like no other. Successful businessmen and women from a variety of industries join forces, support the University and each other, and make friends as they guide a new generation of leaders. 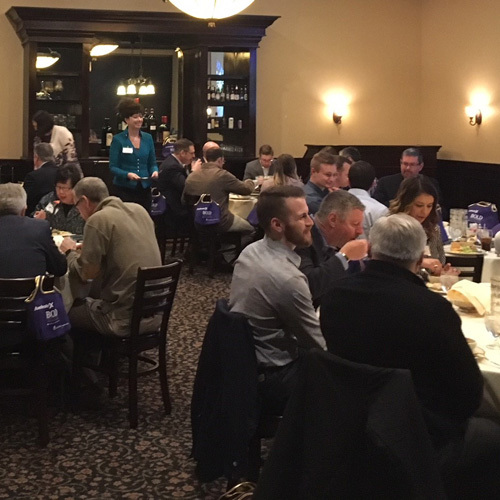 On March 7, Lasting Impressions was thrilled to partner with Nancy Heen, CEO and founder of Axelerate; and Sam Henry, Business Performance Advisor with Insperity, to co-host a complementary luncheon to introduce the Husky Leadership initiative to Seattle area business leaders. 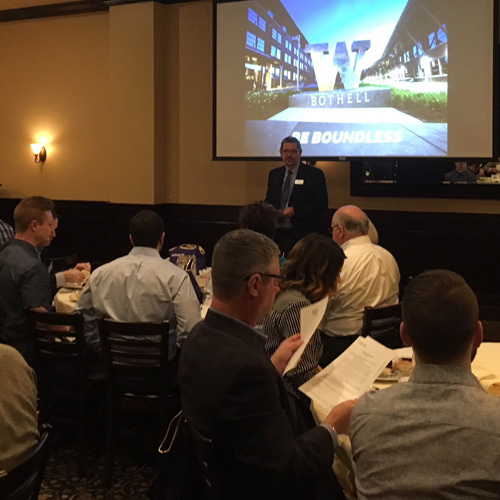 This luncheon was the fourth of its kind in an on-going series dedicated to connecting local small and mid cap companies to top talent at UW Bothell. Insperity’s generous funding made this event possible. It was a rewarding partnership, and as expected, it was great fun. Insperity did an amazing job, and our three businesses are an interesting mix of the dual challenges of hiring and retaining the right people plus attracting and delighting customers. Axelerate matches IT professionals with contract positions, helping business find exactly the right talent, while Insperity provides a full-service HR solution to small and mid cap companies. Lasting Impressions sources and creatively brands the right promotional products for businesses. Our strategic approach gives customers a competitive advantage to attracting, attaining and retaining their target customers and top talent. Lasting Impressions was pleased to provide the eye-catching lunch bag in Husky colors, pictured. 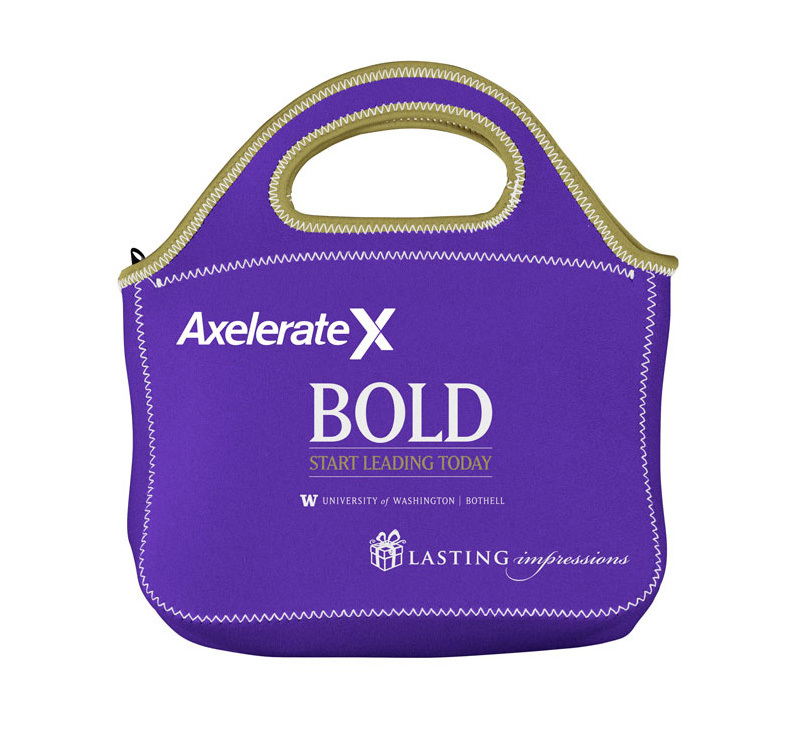 This co-branded and co-funded tote was filled with an essential branded coffee mug from Axelerate and a journal from Lasting Impressions, to capture notes from the event. We also tucked in an article about Insperity, to express our gratitude to Sam for hosting the luncheon. The bright Husky lunch bag did dual duty, adding a pop of color to the chairs in addition to serving as a gift bag for the favors inside and a sturdy, insulated lunch bag to re-use as a keepsake. We design branded merchandise to deliver great eye appeal, immediate and future utility, sentimental value and strategic customization. Finding opportunities to join with another business is a dynamic step. If you are intrigued about the UW Husky Leadership initiative and want to learn more about accessing top talent at UW Bothell, how to host a luncheon such as this to position your firm as an industry thought leader or if you can contribute your company’s leadership skills / resources to UW Bothell, contact Nancy, Sam or myself to engage.